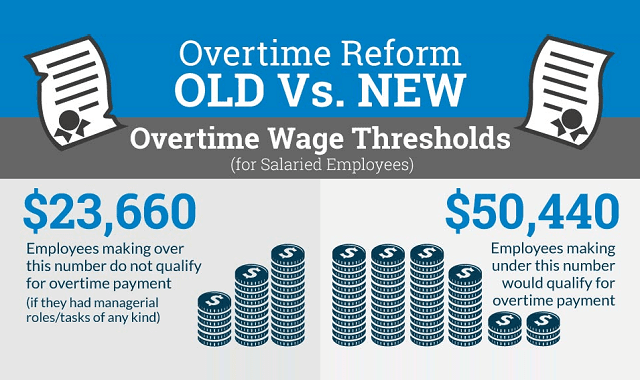 Overtime Reform: What it Means for Workers and Businesses #infographic ~ Visualistan '+g+"
What exactly does overtime reform mean for small businesses and their employees? Earlier this year, President Obama announced his proposal to extend overtime pay to millions of workers who do not receive it currently. Some industries will be more heavily affected than others, but in different ways: more service workers will get extra pay than any other profession, for instance, but those workers will received a few hundred while a small segment of managers and financial professionals will receive an average boost of more than $5,000. This infographic helps make sense of all the different changes this reform proposal will have on different professions and industries. But will this change be good or bad for small business? The National Federation of Independent Businesses has already raised some concerns on the potential consequences of an increase of expenses for both small businesses and their workers. With the reform on track to take effect his year or next, it's important that business owners and employees understand now what effects the new overtime policies would have for them.